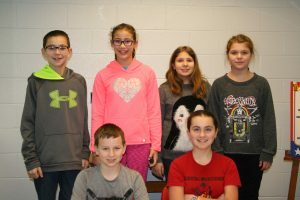 Westfall Elementary has its own news team. WESN broadcasts throughout the elementary daily updating students and staff with pertinent news and information. The elementary has had a news team for several years. The team is advised by teacher, Jackie Eitel. Mrs. Eitel first formed a news team twelve years ago. The anchors and reporters are chosen from fifth-grade students. There is a different news team chosen each semester. Recently, the Westfall Education Foundation funded a $1,800 grant to the news team for the purchase of new video equipment. The team had been using the same used equipment to broadcast the WESN news since 2004. Student news team members are pleased to be working with up-to-date technology. Mrs. Eitel and the current news team expressed their thanks to the foundation for being able to acquire the much-needed video equipment. Click the image below to see a short video of the kids in action!